Aspiring Comic Creators Find Inspiration in the Pages of “Mastering Comics” : COMICS ARE EVERYWHERE! 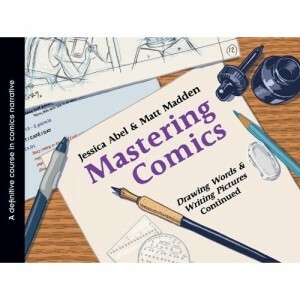 Comic creators Jessica Abel and Matt Madden's smart and user-friendly book Mastering Comics: Drawing Words & Writing Pictures Continued. If you aspiring comic-book artist or writer, there is an abundance of resources available at your fingertips. Or, at the very least, at a local book store near you. I’ve written about Little Fish before, and the studio’s founders Patrick Yurick and Alonso Nunez are the real deal – dedicated artists who made the leap of faith fueled by hard work and vision to becoming comic creators in their own right. You can see the fruits of their creative partnership taking flight with the Web comic, American Boom! If you’re in the San Diego area, be sure to swing by the comic-book release party for American Boom! on March 22, 2013 starting at 8 p.m. Their tiny comic-book studio that roared is also hosting an art show of their students’ work with the Little Fish Student Art Show on April 20, 2013. These true comic-book fiends are on their way up! If there isn’t a college or school teaching comics nearby, don’t despair. You can still learn the ropes the old-fashioned way: Read lots of comics and just dive into the deep end of the pool by writing and drawing your ideas on paper. Fortunately, every quality new and used bookstore has a comics section just waiting for you to discover its creative bounty. With so many titles lining the bookshelves, where do you start? Speaking of books, aspiring cartoonists can’t go wrong by piking up comic creators Jessica Abel and Matt Madden’s impressive how-to books, 2012′s Mastering Comics: Drawing Words & Writing Pictures Continued and the duo’s earlier title, 2008′s Drawing Words & Writing Pictures: Making Comics, Manga, Graphic Novels and Beyond. Recently, I swung by my local Barnes & Nobles and piked up a copy of Mastering Comics. I was impressive with the book’s casual and very user friendly approach breaking down the nuances and technical aspects of the creative process into stages. The authors offer tips on everything from brainstorming ideas and designing page layouts to completing your own mini-comics on the cheap! Not too long ago, I let my artist friend Neil Shigley borrow my copy of Drawing Words & Thinking Pictures as we continue to collaborate on editing the comics anthology Word Balloons, which features original mini-comics written and drawn by students at San Diego State University. Although I’m not teaching at SDSU this semester, I agreed to continue the collaboration. The students love the project and they walk out of the class with a published comic book that all of them can be proud of. Talk about Holy Portfolio piece, Batman! So, what are waiting for? Your comic isn’t going to write and draw itself! Time to get to work! Your personal comic-book and artistic dreams are waiting to be set into motion! You are the key to making it happen! Now is the time to stop talking about making art and start making it! Plus, you can have lots of fun immersing yourself in creativity in the process!